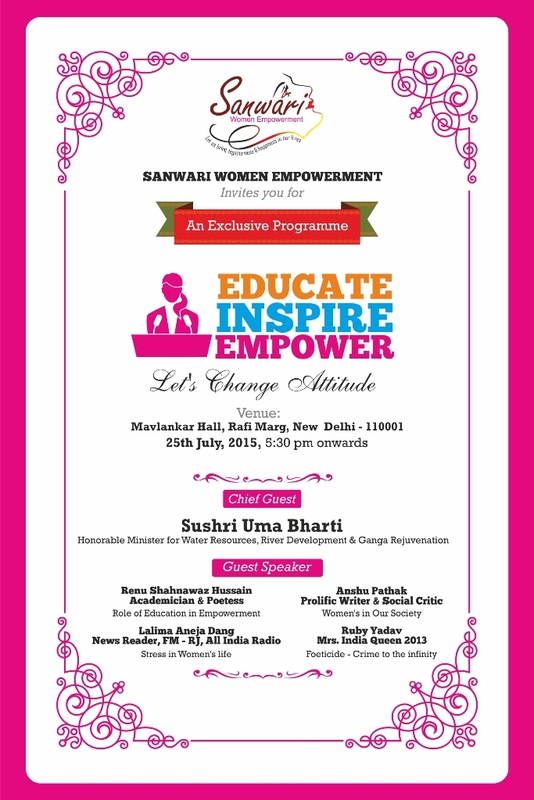 Sanwari Women Empowerment an exclusive programme at Mavlankar Hall, Rafi Marg, New Delhi-110001 on 25th July 2015. Seminar subject is women Empowerment related issues. The programme will have views on prevailing issues for women empowerment in Indian community from leading social activists in India. It will cover many issues such as gender equality and its various aspects, Women Security, Self Relaince for Women. Apart from the discussions we will also have thought provoking performances by noted TV personality Sudha Chandran and renowned performer Mrinalini. Sanwari Women Empowerment popularly known as 'Sanwari' is a not for profit organization based in New Delhi founded by Seema Goel Social Activist. With membership strength nearing four digits, it is gradually being recognised as a shining star in the women welfare space. We have a wide range of activities related to societal changes for Gender Equality, Economic Upliftment, Quality of Life, Motherhood Guidance, Over all Women Empowerment and Women Security. Sanwari has a vision that if we work on these areas women will be able to live a good quality life in a Self-Reliant and Dignified manner. Health: To improve the quality of life, we work on nutritional front, preventive healthcare and health awareness camps for women of all ages. Sanwari campaigns for an all-round fitness comprising of Mind, Body & Soul, as we feel a healthy woman is the pillar of healthy society. Education: Sanwari also encourages the young girls from the weaker section of the society to take up Skill Development and continue studies. We at Sanwari are determined to improve Self-Reliance Capabilities of women. Motherhood: Sanwari not only takes care about physical health, but emotional health as well. We support the mothers of differently abled children adding million smiles to the faces of those who require special attention. Being a women organisation with emotion centric temperament Sanwari takes up the cause of elders who need care as well. Gender Equality & Women Security: We at Sanwari aim to bring change in the society to ensure Gender Equality so that a woman can live in a safe and secure environment. Our motto is to replace Gender Discrimination with Women Dignity as a core element of the Indian society. Sanwari Women Empowerment transforms the society where women live with Self Reliance rather than Subsistence. Society should inculcate the temperament of Dignity for women rather than discriminating her.